We, at Technical Traders Ltd., believe recent data released by China presents traders with a huge opportunity over the next 6~18 months. 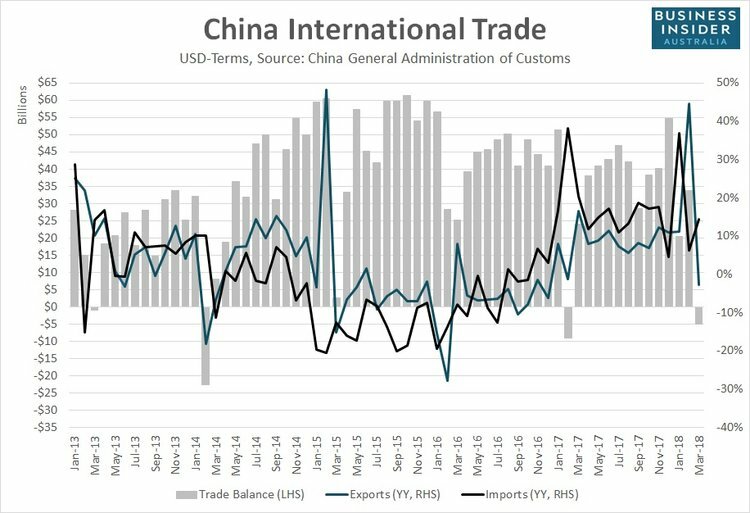 Recently released Chinese economic market data points to a general market disruption in regards to trade values, import/export data and loan/debt risk. As reported by Reuters and Business Insider, the continued crackdown on Shadow Banking in China, as well as recently announced trade tariffs, may be shifting the dynamics of the Chinese Dragon economy dramatically. Additionally, we recently read an article where the IMF intended to discuss the numerous Chinese expansion projects throughout the globe in an effort to attempt to restrain “partner country debt risks”. We believe the intent of the IMF is to attempt to protect partner countries from entering into what appear to be expansion projects (backed by China) while risking a debt collapse in the near future. Much like Greece or Puerto Rico, once a poor nation crosses that debt to GDP ratio, it is almost impossible to recover because the debt balance become insurmountable. In terms of US market research and investment opportunities, this new data from China presents a number of new opportunities in terms of market dynamics. First, we believe China will continue to decrease its capital reserves in an attempt to prop up their economic functions. Secondly, the new trade tariffs will put additional pressure on the Chinese economy. Lastly, we believe the consumer and real estate market cycles will come into play over the next 6~18 months which will create further pressure within the Chinese economy. Because of all of these factors, in addition to the fact that much of the Chinese economic expansion is debt based, we believe a massive capital migration into US, Canadian and UK stocks will become more evident over the next 6+ months. Our research team has been working to identify these opportunities for our members and to position our clients properly for this future move. Our advanced predictive modeling systems have been DEAD ON accurate for the past 5+ months with regards to these major market moves. 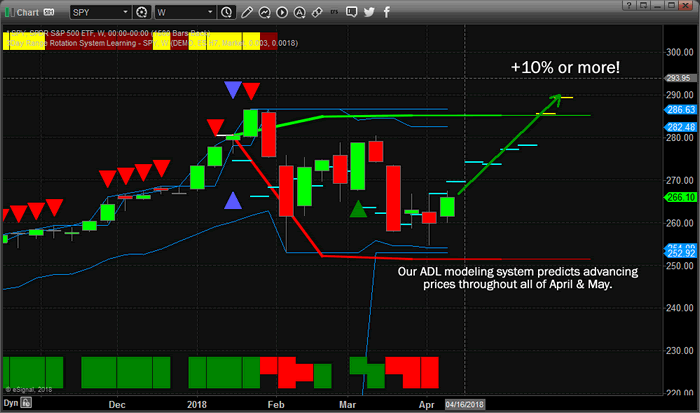 The chart, below, shows our ADL predictions for the SPY throughout the end of May 2018. As you can see, our price modeling system is predicting that prices will continue to advance for the next 6+ weeks. We believe that as the Chinese economic data continue to roll in with mixed results, the capital migration to the US and other established markets will be tremendous and push US equities to new highs. Additionally, this potential move opens up a number of possibilities in commodities and other equities throughout the next 18+ months. If you want to learn how our research team at www.TheTechnicalTraders.com can assist you in finding these opportunities then please visit our website to learn more and read some of our most recent research reports. 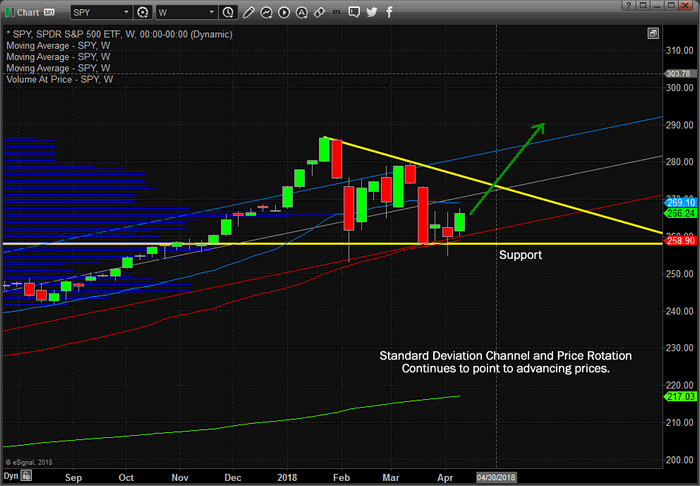 Pay close attention to our recent China Collapse article for more detailed information regarding our thinking. Trust us – you won’t want to miss this move in the markets.